Preowned. Excellent Condition. 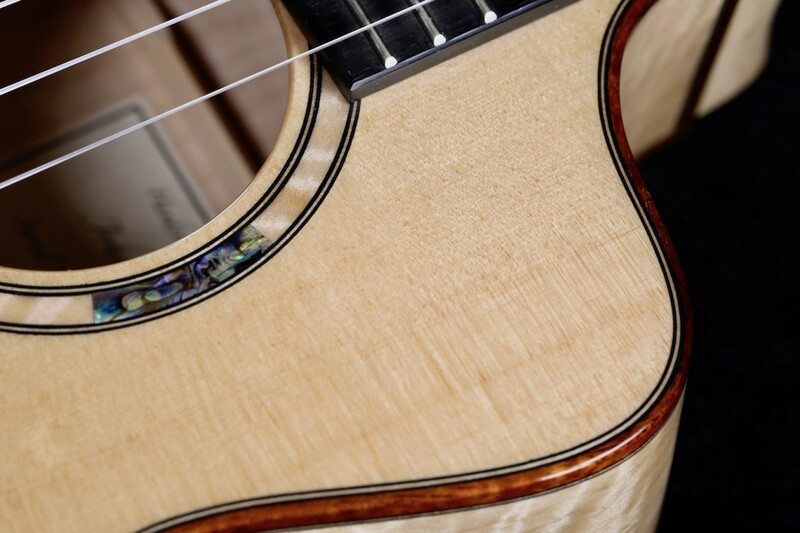 Beautiful John Kinnard ‘Hybrid’ Ukulele handcrafted in Fallbrook, California with the utmost attention to detail and tone. 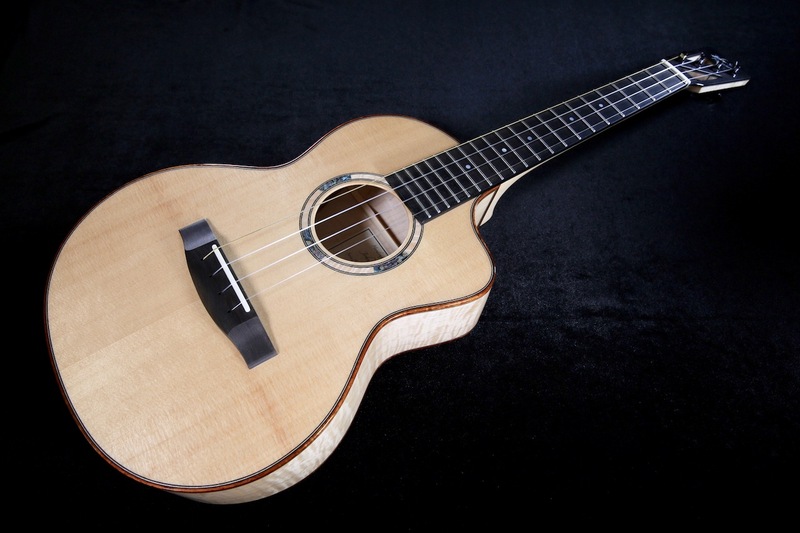 This beautiful Custom John Kinnard ‘Hybrid’ Baritone ukulele is the masterpiece in fit, finish, playability and tone of collaborative efforts between world renowned ukulele musician, Kimo Hussey, and the meticulous craftsmanship of master luthier John Kinnard of Kinnard Ukuleles in Fallbrook, CA. This beautiful instrument can be tuned in either gCEA tuning or Bb tuning (F, Bb, D, G – one full octave lower than the gCEA tuning) and has tremendous range, sustain, and versatility. 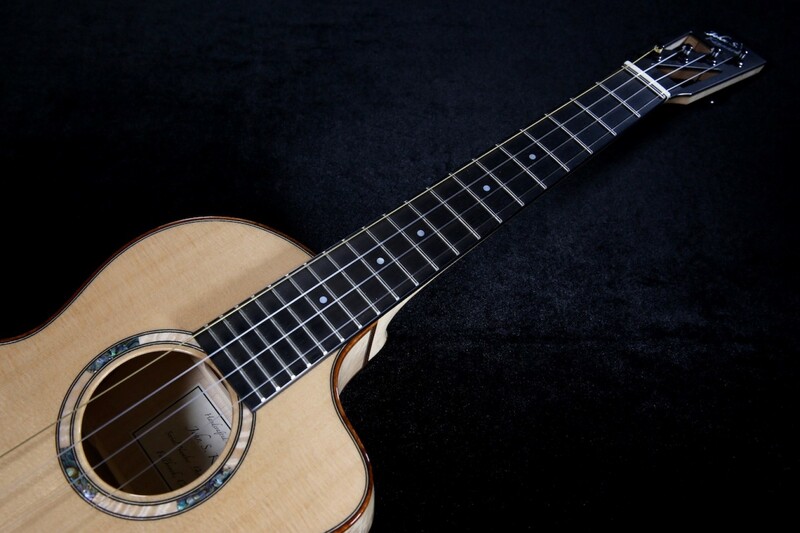 It is a remarkable instrument that offers a full and rich tone with the benefit of a standard gCEA or one octave lower F, Bb, D, G tuning without the floppiness often associated with a baritone ukulele. 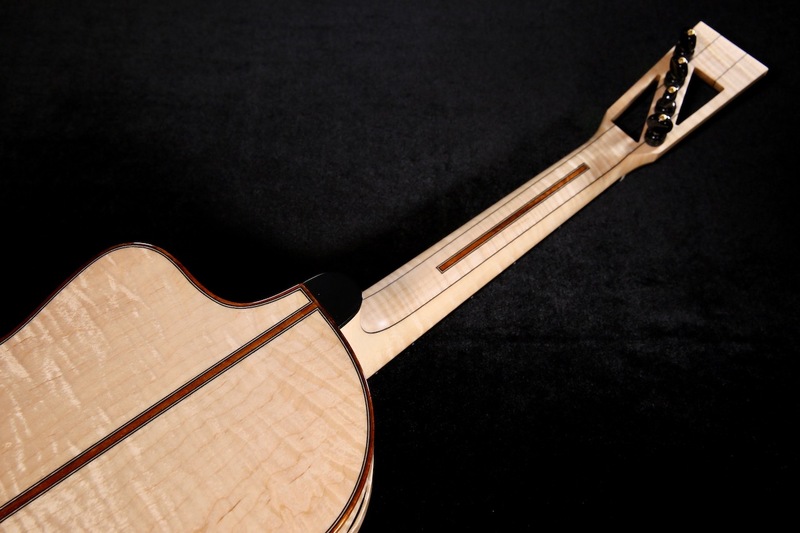 Truly a blend of two worlds with the slightly larger baritone style body and fuller sound box but a tuning and bracing design that can sustain the added string tension needed for gCEA or F, Bb, D, G tuning. This is a unique piece that would be treasured among even the most renowned professional ukulele musicians and the recreational player alike. Nestled in the foothills of northern San Diego County just inland from the coast, sits the small village of Fallbrook, California. Known for its mild climate and laid back lifestyles, artisans of different genres cultivate their craft inspired by the beauty of the valleys and mountains that surround the town. 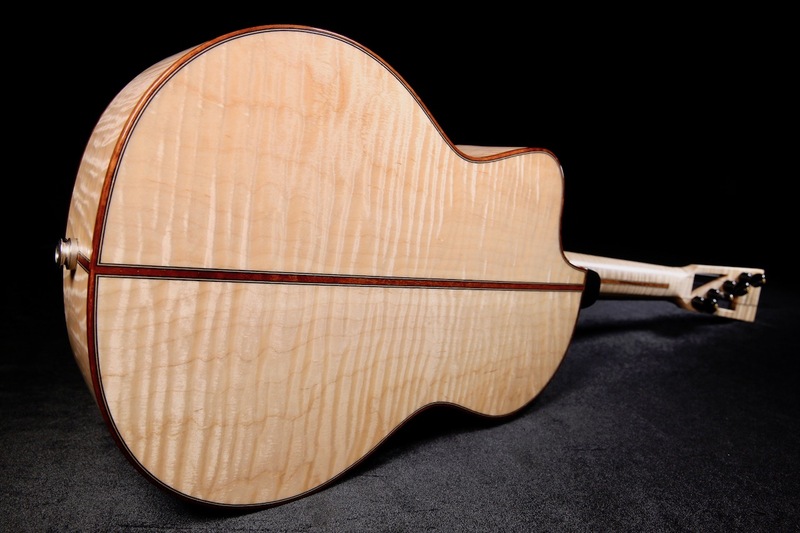 One such artist is John S. Kinnard, an “old school” luthier who has established himself as a master of his trade in a day when CNC machines cough out “cookie cutter” parts to be assembled like a child’s puzzle. 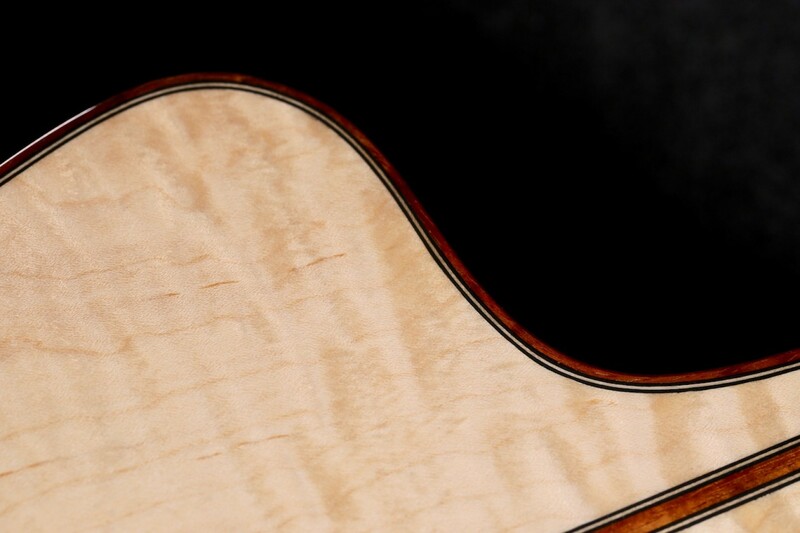 Working out of his one man shop, John arguably builds some of the finest stringed instruments in the world by hand. 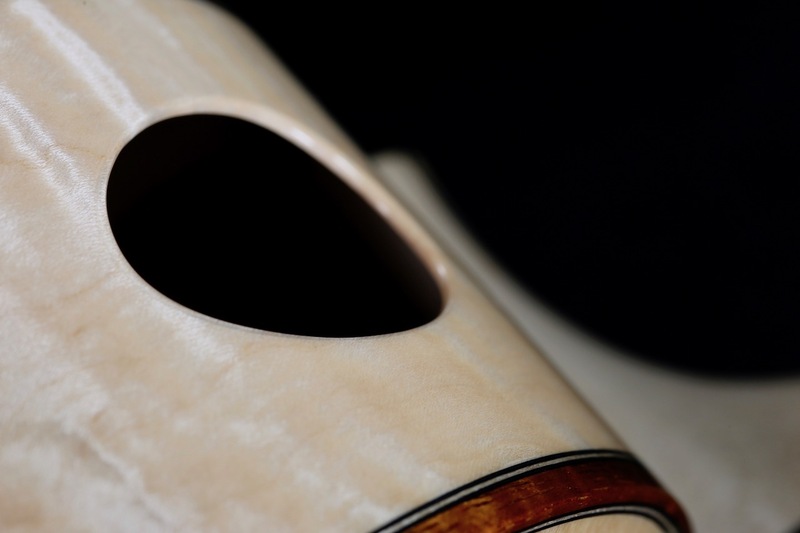 He does them one by one – molding and shaping the parts and assembling them to create instruments that not only look stunning when completed, but also possess something that the mass produced instruments lack – the soul of the luthier. 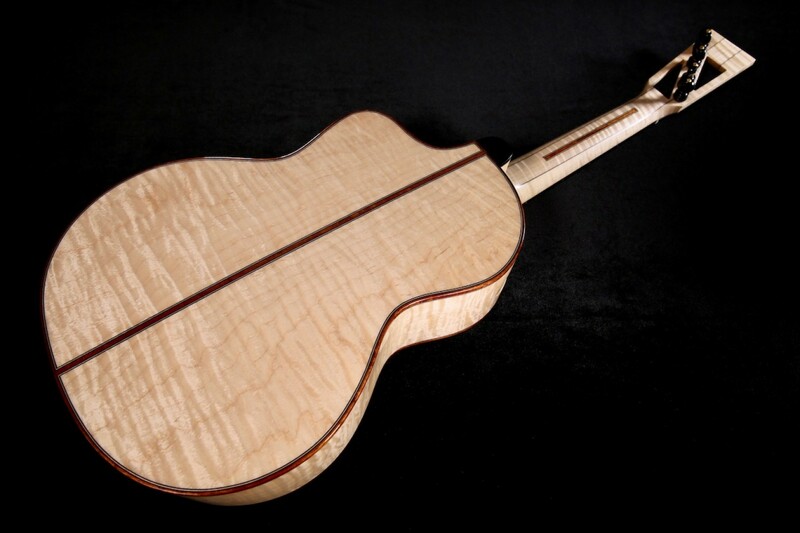 John has been building guitars, mandolins and ukuleles in a career that has spanned more than forty five years and is best known as the luthier behind the Dell’ Arte brand of gypsy style guitars played around the world. 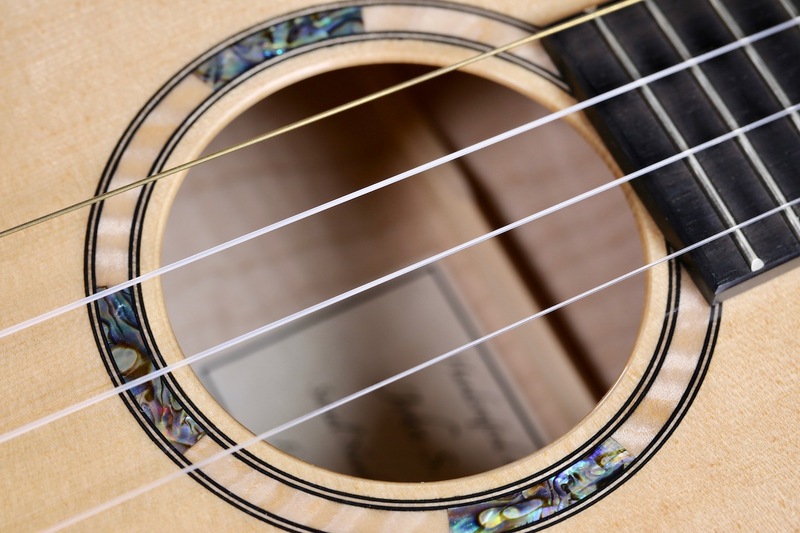 Like many artists, his creativity spills over into other mediums including oil and watercolor painting and also jewelery making – talents that have served him well in making him the luthier he is today. 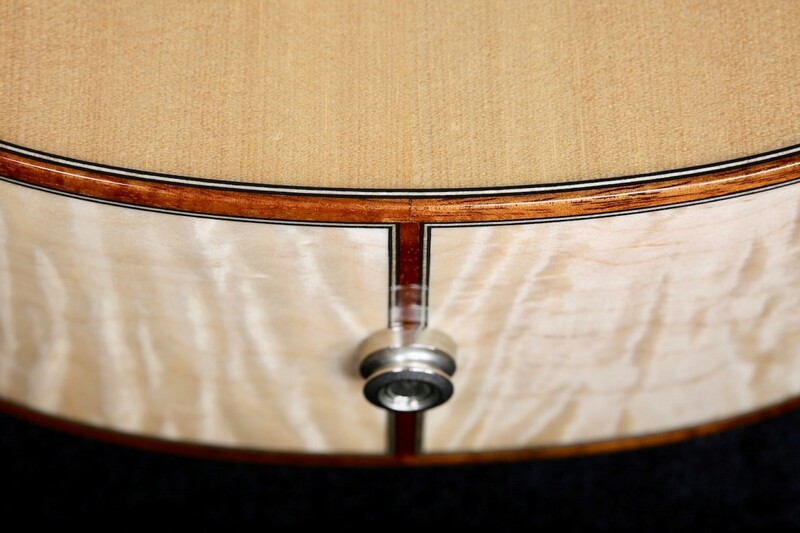 Master grade flamed tiger Maple wood back and sides with a spruce soundboard, at first glance you would think this instrument has a bright sound with the wood combinations mentioned above. In the hands of John, however, this ukulele is on contrary exactly the opposite. It has tremendous warmth and clarity with great note separation. 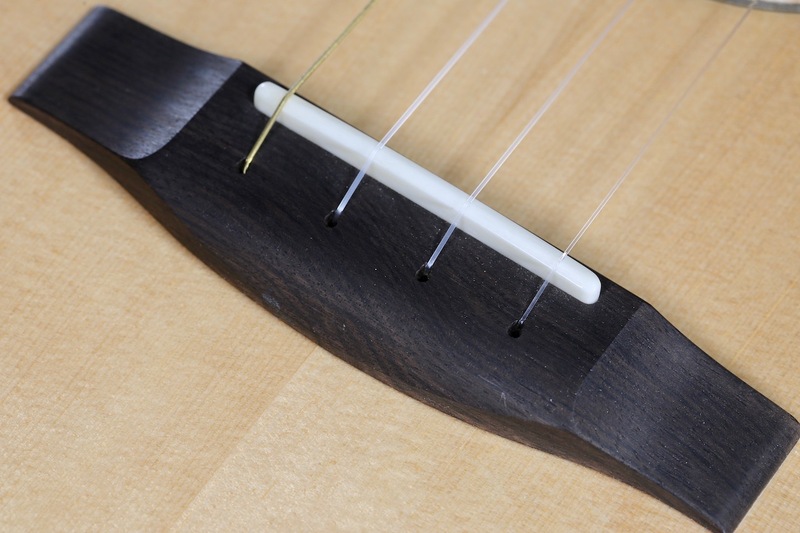 Zero fret set up with a 13 fret joint to the body and 20 overall frets to the sound hole. 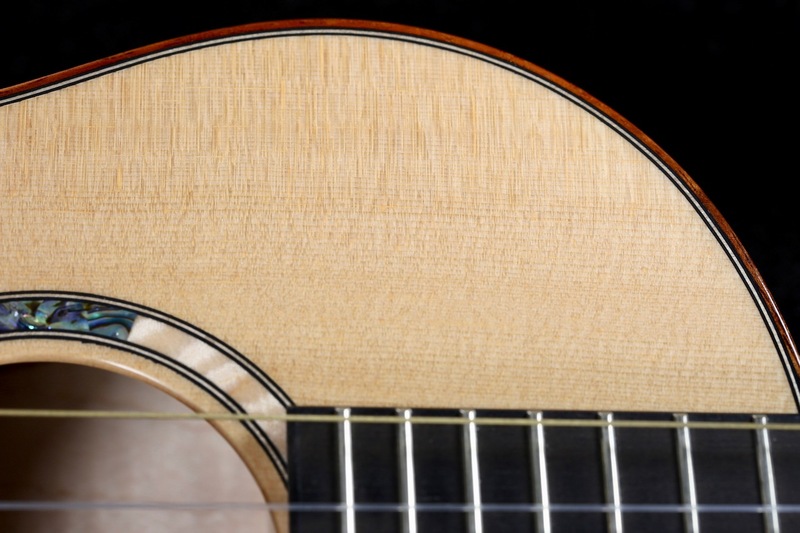 The body leans more toward the size of a baritone but with all the benefits of a tenor tuning of gCEA or a Bb tuning, one full octave lower (F, Bb, D, G). 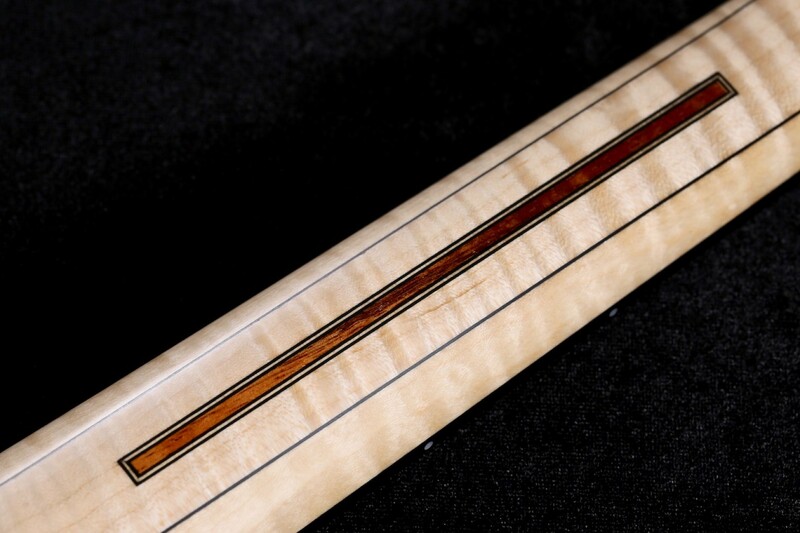 Center back strip of Hawaiian Koa wood for aesthetic appeal and matching Hawaiian Koa wood strip inlay on the neck in keeping with the theme of the instrument. 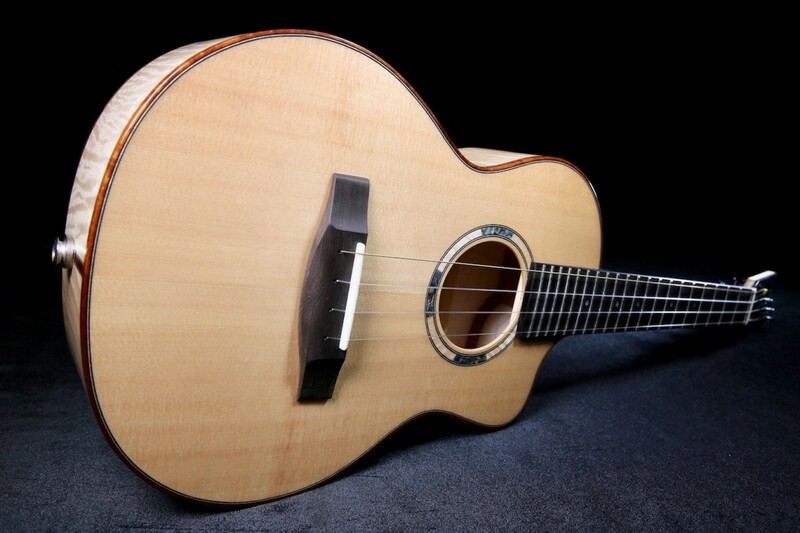 The spruce soundboard was meticulously hand-tuned, giving this ukulele a wonderful and sweet tone. 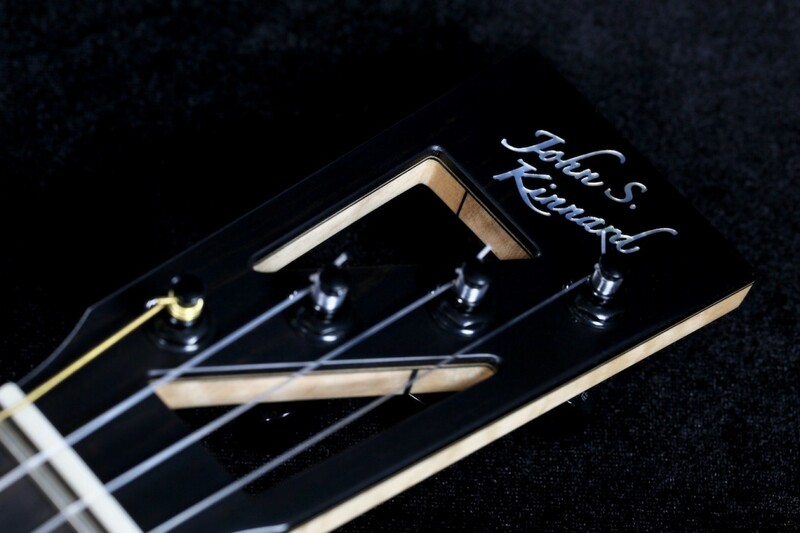 It boasts a Gabon Ebony wood radiused fingerboard for ease of play higher up on the neck, and a Gabon Ebony wood bridge and headstock veneer in keeping with the theme of the instrument. 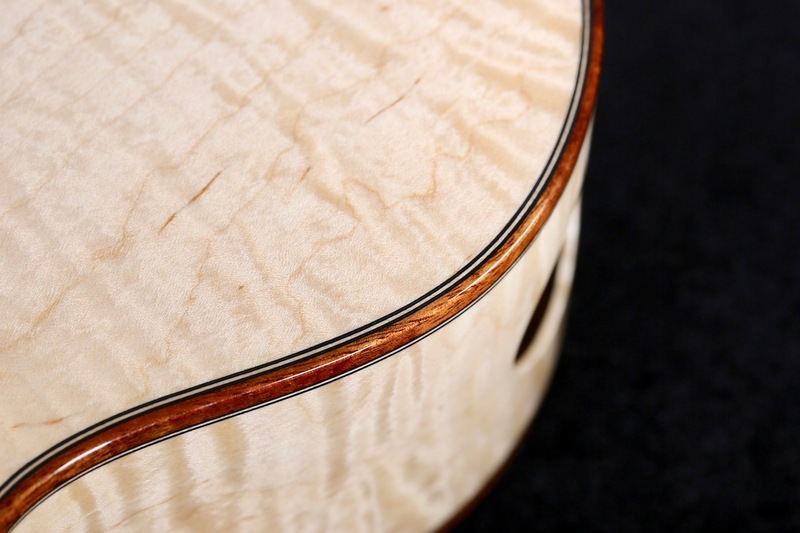 Hawaiian Koa wood top and back binding and matching end graph, accent Maple wood and paua shell rosette are a few more amenities that add to the beauty of this Hybrid Kinnard baritone ukulele. 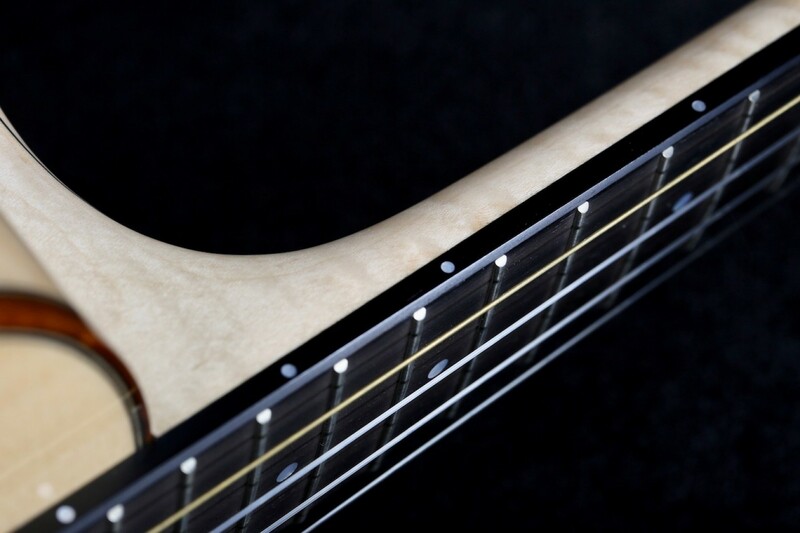 A double carbon fiber reinforced Tiger Maple wood neck has also been employed to match the back and sides of the instrument. Professional Gotoh UPT tuners for smooth and precise tuning. 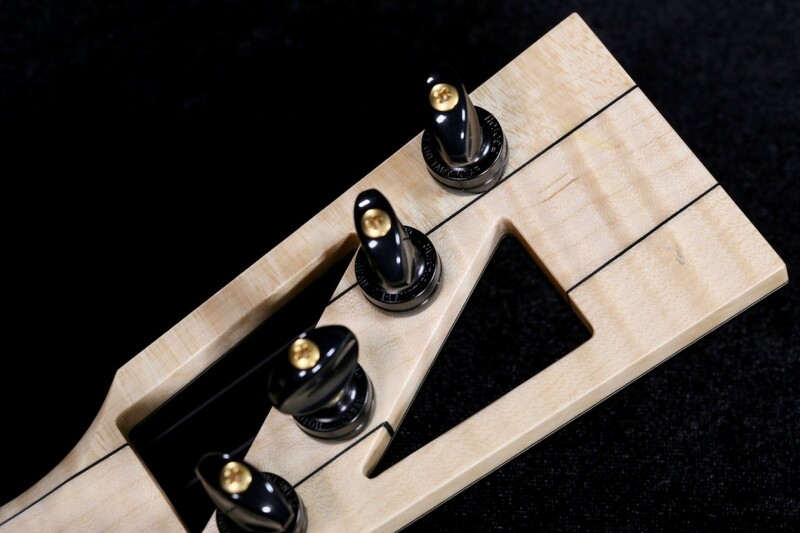 Z-slotted headstock and side sound port. High gloss finish. Professional pick up for quick plug and play.